plus ethernet interfaces and extensive software. 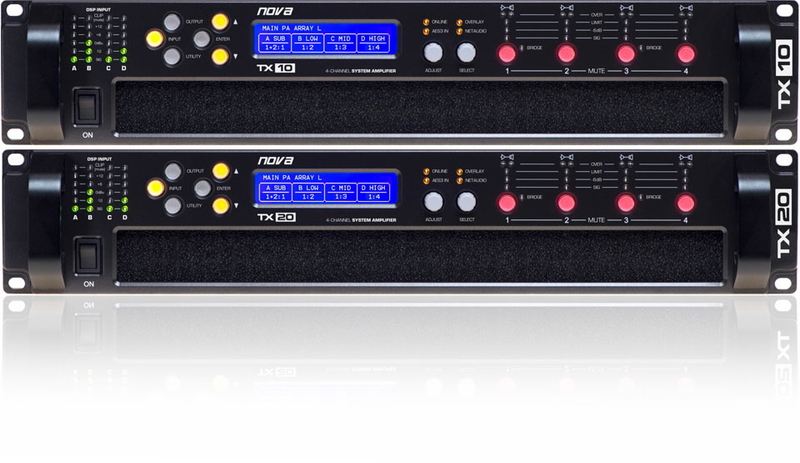 The NOVA TX10 and TX20 are 4-channel power amplifiers, which offer a unique combination of power and audio performance, seamlessly combined with advanced DSP and network control. The TX10 delivers 2.500 watts per channel or 5.000 watts for a bridged pair. The TX20 delivers 5.000 watts per channel or 10.000 watts for a bridged pair. State of the art components and a finely optimised design results in generous power reserves that ensures pristine sound quality is maintained even under the most extreme conditions. itself. Even a firmware update can be made easily via the network. auto-IP and direct connection to a computer without the need for a router or a switch. networking card is available as option. The powerful drive module concept allows for abstraction from device centric to speaker based control. The TX10 and TX20 use drive module presets, which are defined as a number of outputs driven from one DSP input. 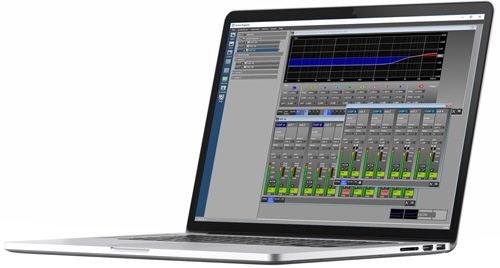 This system allows for better flexibility and greater functionality when loading and storing presets. Drive modules allow for a less processor-centric and more speakerorientated system design. The TX amplifiers allow 50 drive module presets to be stored. Presets are stored permanently inside the amplifiers and so will always be available even if the devices are not being used with the NOVA.Net software. Under all circumstances the control and protection systems will endeavour to deliver the maximum power possible for a given set of conditions, applying limiters only in extreme circumstances. problems to remote devices either via the network or the volt‐free changeover relay contacts accessible on the rear panel. Vx provides a linear phase virtual crossover and two limiter paths on each output.